The Abbey-Principality is dedicated to the memory of Saint Louis (1214-70), who reigned as King Louis IX of France between 1226 and his death. 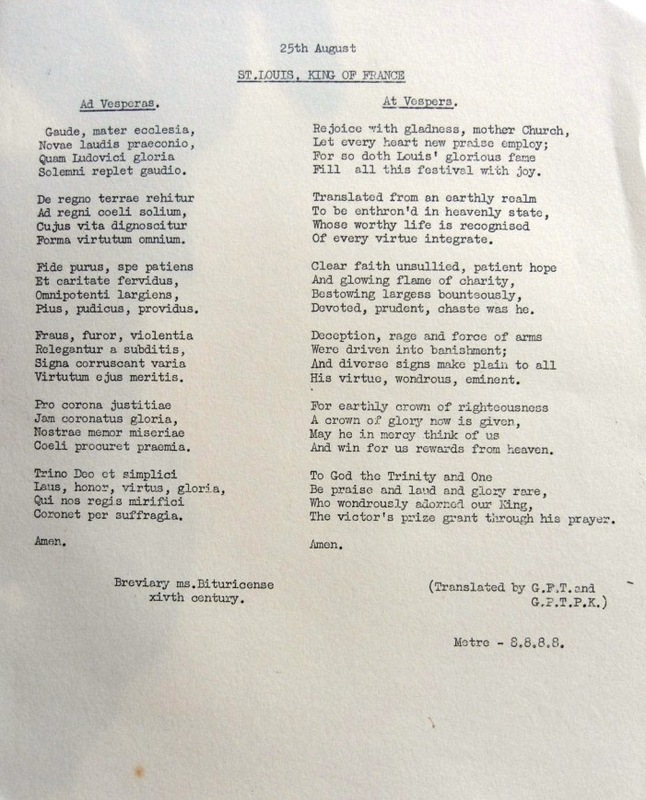 The feast day of St Louis, which is also the commemoration of the foundation of the Abbey-Principality, is 25 August. The Mass is celebrated by all clergy associated with the Abbey-Principality in memory of St. Louis. “St Louis, King of France, son of Louis VIII and Blanche of Castile, born at Poissy, 25 April, 1215; died near Tunis, 25 August, 1270. He was eleven years of age when the death of Louis VIII made him king, and nineteen when he married Marguerite of Provence by whom he had eleven children. The regency of Blanche of Castile (1226-1234) was marked by the victorious struggle of the Crown against Raymond VII in Languedoc, against Pierre Mauclerc in Brittany, against Philip Hurepel in the Ile de France, and by indecisive combats against Henry III of England. In this period of disturbances the queen was powerfully supported by the legate Frangipani. 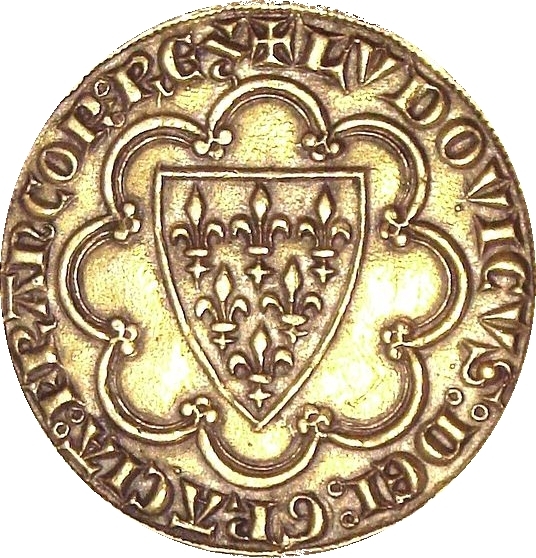 Accredited to Louis VIII by Honorius III as early as 1225, Frangipani won over to the French cause the sympathies of Gregory IX, who was inclined to listen to Henry III, and through his intervention it was decreed that all the chapters of the dioceses should pay to Blanche of Castile tithes for the southern crusade. It was the legate who received the submission of Raymond VII, Count of Languedoc, at Paris, in front of Notre-Dame, and this submission put an end to the Albigensian war and prepared the union of the southern provinces to France by the Treaty of Paris (April 1229). The influence of Blanche de Castile over the government extended far beyond St. Louis’s minority. Even later, in public business and when ambassadors were officially received, she appeared at his side. She died in 1253. In the first years of the king’s personal government, the Crown had to combat a fresh rebellion against feudalism, led by the Count de la Marche, in league with Henry III. St. Louis’s victory over this coalition at Taillebourg, 1242, was followed by the Peace of Bordeaux which annexed to the French realm a part of Saintonge. It was one of St. Louis’s chief characteristics to carry on abreast his administration as national sovereign and the performance of his duties towards Christendom; and taking advantage of the respite which the Peace of Bordeaux afforded, he turned his thoughts towards a crusade. Stricken down with a fierce malady in 1244, he resolved to take the cross when news came that Turcomans had defeated the Christians and the Moslems and invaded Jerusalem. (On the two crusades of St. Louis [1248-1249 and 1270] see CRUSADES.) Between the two crusades he opened negotiations with Henry III, which he thought would prevent new conflicts between France and England. The Treaty of Paris (28 May, 1258) which St. Louis concluded with the King of England after five years’ parley, has been very much discussed. By this treaty St. Louis gave Henry III all the fiefs and domains belonging to the King of France in the Dioceses of Limoges, Cahors, and Périgueux; and in the event of Alphonsus of Poitiers dying without issue, Saintonge and Agenais would escheat to Henry III. On the other hand Henry III renounced his claims to Normandy, Anjou, Touraine, Maine, Poitou, and promised to do homage for the Duchy of Guyenne. It was generally considered and Joinville voiced the opinion of the people, that St. Louis made too many territorial concessions to Henry III; and many historians held that if, on the contrary, St. Louis had carried the war against Henry III further, the Hundred Years War would have been averted. But St. Louis considered that by making the Duchy of Guyenne a fief of the Crown of France he was gaining a moral advantage; and it is an undoubted fact that the Treaty of Paris was as displeasing to the English as it was to the French. In 1263, St. Louis was chosen as arbitrator in a difference which separated Henry III and the English barons: by the Dit d’Amiens (24 January, 1264) he declared himself for Henry III against the barons, and annulled the Provisions of Oxford, by which the barons had attempted to restrict the authority of the king. It was also in the period between the two crusades that St. Louis, by the Treaty of Corbeil, imposed upon the King of Aragon the abandonment of his claims to all the fiefs in Languedoc excepting Montpellier, and the surrender of his rights to Provence (11 May, 1258). Treaties and arbitrations prove St. Louis to have been above all a lover of peace, a king who desired not only to put an end to conflicts, but also to remove the causes for fresh wars, and this spirit of peace rested upon the Christian conception. St. Louis’s relations with the Church of France and the papal Court have excited widely divergent interpretations and opinions. However, all historians agree that St. Louis and the successive popes united to protect the clergy of France from the encroachments or molestations of the barons and royal officers. 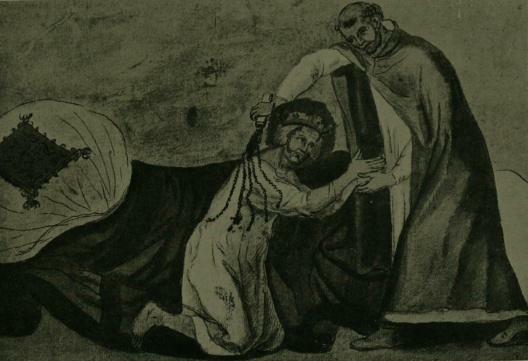 It is equally recognized that during the absence of St. Louis at the crusade, Blanche of Castile protected the clergy in 1251 from the plunder and ill-treatment of a mysterious old marauder called the “Hungarian Master” who was followed by a mob of armed men — called the “Pastoureaux.” The “Hungarian Master” who was said to be in league with the Moslems died in an engagement near Villaneuve and the entire band pursued in every direction was dispersed and annihilated. But did St. Louis take measures also to defend the independence of the clergy against the papacy? A number of historians once claimed he did. 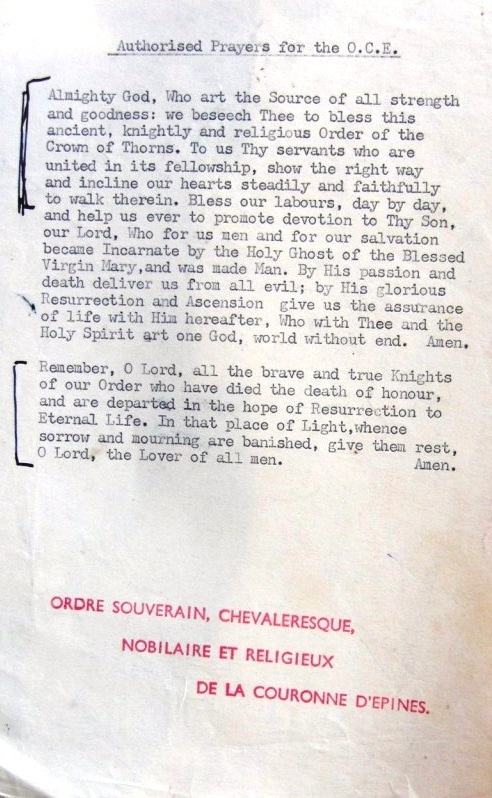 They attributed to St. Louis a certain “pragmatic sanction” of March 1269, prohibiting irregular collations of ecclesiastical benefices, prohibiting simony, and interdicting the tributes which the papal Court received from the French clergy. The Gallicans of the seventeenth and eighteenth centuries often made use of this measure against the Holy See; the truth is that it was a forgery fabricated in the fourteenth century by juris-consults desirous of giving to the Pragmatic Sanction of Charles VII a precedent worthy of respect. This so-called pragmatic of Louis IX is presented as a royal decree for the reformation of the Church; never would St. Louis thus have taken upon himself the right to proceed authoritatively with this reformation. When in 1246, a great number of barons from the north and the west leagued against the clergy whom they accused of amassing too great wealth and of encroaching upon their rights, Innocent IV called upon Louis to dissolve this league; how the king acted in the matter is not definitely known. On 2 May, 1247, when the Bishops of Soissons and of Troyes, the archdeacon of Tours, and the provost of the cathedral of Rouen, despatched to the pope a remonstrance against his taxations, his preferment of Italians in the distribution of benefices, against the conflicts between papal jurisdiction and the jurisdiction of the ordinaries, Marshal Ferri Pasté seconded their complaints in the name of St. Louis. Shortly after, these complaints were reiterated and detailed in a lengthy memorandum, the text of which has been preserved by Mathieu Paris, the historian. It is not known whether St. Louis affixed his signature to it, but in any case, this document was simply a request asking for the suppression of the abuses, with no pretensions to laying down principles of public right, as was claimed by the Pragmatic Sanction. Documents prove that St. Louis did not lend an ear to the grievances of his clergy against the emissaries of Urban IV and Clement IV; he even allowed Clement IV to generalize a custom in 1265 according to which the benefices the titularies of which died while sojourning in Rome, should be disposed of by the pope. Docile to the decrees of the Lateran Council (1215), according to which kings were not to tax the churches of their realm without authority from the pope, St. Louis claimed and obtained from successive popes, in view of the crusade, the right to levy quite heavy taxes from the clergy. It is again this fundamental idea of the crusade, ever present in St. Louis’s thoughts that prompted his attitude generally in the struggle between the empire and the pope. While the Emperor Frederick II and the successive popes sought and contended for France’s support, St. Louis’s attitude was at once decided and reserved. On the one hand he did not accept for his brother Robert of Artois, the imperial crown offered him by Gregory IX in 1240. In his correspondence with Frederick he continued to treat him as a sovereign, even after Frederick had been excommunicated and declared dispossessed of his realms by Innocent IV at the Council of Lyons, 17 July, 1245. But on the other hand, in 1251, the king compelled Frederick to release the French archbishops taken prisoners by the Pisans, the emperor’s auxiliaries, when on their way in a Genoese fleet to attend a general council at Rome. In 1245, he conferred at length, at Cluny, with Innocent IV who had taken refuge in Lyons in December, 1244, to escape the threats of the emperor, and it was at this meeting that the papal dispensation for the marriage of Charles Anjou, brother of Louis IX, to Beatrix, heiress of Provençe was granted and it was then that Louis IX and Blanche of Castile promised Innocent IV their support. Finally, when in 1247 Frederick II took steps to capture Innocent IV at Lyons, the measures Louis took to defend the pope were one of the reasons which caused the emperor to withdraw. St. Louis looked upon every act of hostility from either power as an obstacle to accomplishing the crusade. In the quarrel over investitures, the king kept on friendly terms with both, not allowing the emperor to harass the pope and never exciting the pope against the emperor. 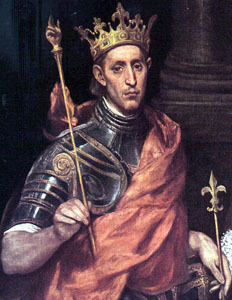 In 1262 when Urban offered St. Louis, the Kingdom of Sicily, a fief of the Apostolic See, for one of his sons, St. Louis refused it, through consideration for the Swabian dynasty then reigning; but when Charles of Anjou accepted Urban IV’s offer and went to conquer the Kingdom of Sicily, St. Louis allowed the bravest knights of France to join the expedition which destroyed the power of the Hohenstaufens in Sicily. 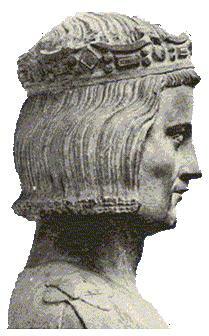 The king hoped, doubtless, that the possession of Sicily by Charles of Anjou would be advantageous to the crusade. St. Louis led an exemplary life, bearing constantly in mind his mother’s words: “I would rather see you dead at my feet than guilty of a mortal sin.” His biographers have told us of the long hours he spent in prayer, fasting, and penance, without the knowledge of his subjects. The French king was a great lover of justice. French fancy still pictures him delivering judgements under the oak of Vincennes. It was during his reign that the “court of the king” (curia regis) was organized into a regular court of justice, having competent experts, and judicial commissions acting at regular periods. These commissions were called parlements and the history of the “Dit d’Amiens” proves that entire Christendom willingly looked upon him as an international judiciary. It is an error, however, to represent him as a great legislator; the document known as “Etablissements de St. Louis” was not a code drawn up by order of the king, but merely a collection of customs, written out before 1273 by a jurist who set forth in this book the customs of Orléans, Anjou, and Maine, to which he added a few ordinances of St. Louis. St. Louis was a patron of architecture. 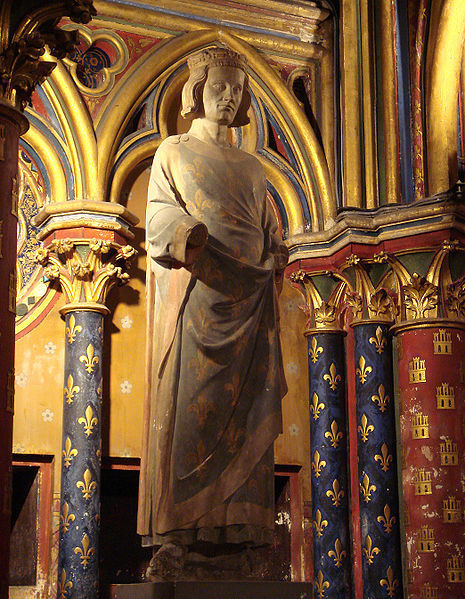 The Sainte Chappelle, an architectural gem, was constructed in his reign, and it was under his patronage that Robert of Sorbonne founded the “Collège de la Sorbonne,” which became the seat of the theological faculty of Paris.